The Modern Welsh Dictionary is intended for the growing number of learners of Welsh in all walks of life, and is designed with your needs in mind. It contains hundreds of example phrases of spoken and written Welsh, so that you can see the language in context. Excellent grammar notes on tricky words and important topics mean that help is always on hand, whether you are working in Welsh or in English. 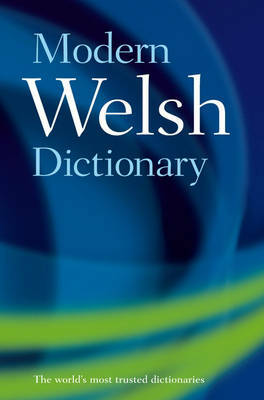 The handy paperback format and superior coverage of vocabulary makes the Modern Welsh Dictionary the first choice for beginner- and intermediate-level learners of the language, as well as those who want a quick-reference dictionary that can be carried easily. Native Welsh speakers will also find the Modern Welsh Dictionary a useful resource in clarifying questions of vocabulary, grammar and usage. You won't need to resort to English to say that you are sending an email or using the Internet, as the Modern Welsh Dictionary has comprehensive coverage of contemporary Welsh. Bydd Cymry Cymraeg hefyd yn darganfod bod y Geiriadur Cymraeg Cyfoes yn adnodd defnyddiol i ateb cwestiynau ar eirfa, gramadeg a defnydd. Mae'r Geiriadur Cymraeg Cyfoes yn cynnwys triniaeth gyflawn o'r iaith gyfoes - fydd dim rhaid defnyddio'r Saesneg i ddweud eich bod yn gyrru e-bost neu'ch bod ar y rhyngrwyd byth eto! Very clear with good notes on grammar. Found vocabulary rather limited. Lots of words I looked up were not there, quite basic words.